The Safety and Health Protection on the Job is a job safety law poster by the California Department Of Industrial Relations. This is a mandatory posting for all employers in California, and businesses who fail to comply may be subject to fines or sanctions. It appears you don't have a PDF plugin for this browser. Please see the link below to download california-shpstreng012000.pdf. Failure to do so could result in a substantial penalty. 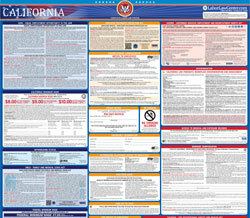 Cal/OSHA standards can be found at www.dir.ca.gov/samples/search/query.htm. 8 hours can result in a minimum civil penalty of  $5,000. Never allow an untrained employee to perform hazardous  work. Cal/OSHA investigator inspecting  your workplace. hazard to the employee or other employees. hazard  that could  result in  an  injury  or  illness  to  an employee . While working, you must always obey state workplace  safety and health laws. access to safety data sheets, and training on how to use hazardous chemicals  safely. ’s collective bargaining representative, or an employee’s physician. exposure to potentially toxic materials or  harmful physical agents. e limits allowed by Cal/OSHA  standards. company is obeying workplace safety and health laws. When an inspection begins, the Cal/OSHA investigator will show official identification. employees about safety and health conditions at the workplace. Regulations, ti tle 8, section 336 (www.dir.ca.gov/title8/336.html). liability company, the fine may be up to $1.5 million. receipt to the Occupational Safety and Health Appeals Board. Oc cupational Safety and Health Appeals B oard. t office of Cal/OSHA. If you prefer, you may retain a competent private consultant, or  ask your workers’ compensation insurance carrier for guidance in obtaining information.